Confiserie Sprüngli is an institution in Zurich and I can never make up my mind: is it a shop or a tearoom? Bankers, office workers and Zurich housewives sit at the outdoor terrace enjoying a frothy cappuccino accompanied by friandise, petit fours and Luxemburgli. Tourists and locals walk out of the shop with elegant boxes full of Truffes du jour, Lindt chocolate bars or chocolates with the most irresistible creamy fillings. The origins of the company go back to 1845. When chocolatier David Sprüngli set up shop in Zurich. Thirty years later, Sprungli bought the Lindt factory. Rudolf Lindt had developed a way to melt chocolate which he called chocolat fondant. This technique made Swiss chocolate world famous. Sprüngli stores are scattered across the city. 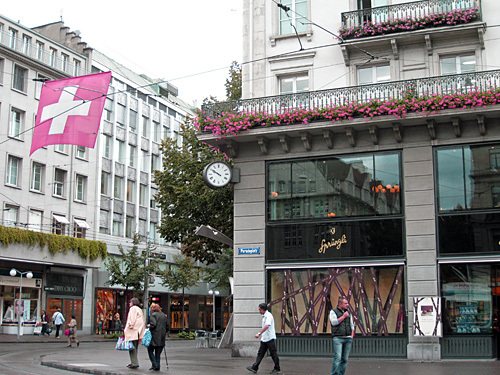 The flagship store at Paradeplatz, off Bahhofstrasse, is a popular spot for breakfast, lunch and afternoon tea. Sprüngli stores are scattered throughout the city meaning there is always a spot to indulge in chocolate. Surprisingly, Sprüngli's most popular product is not its chocolate but Luxemburgerli, macaroon biscuits that come in a variety of flavours, such as hazelnut, vanilla, lemon, caramel, chocolate, raspberry and champagne. They look like miniature hamburgers but are made of pastry and cream sandwiched together. They have to be eaten almost immediately, because they are made of fresh ingredients. Sprüngli makes 90% of their 2000 or so products by hand, using fresh products. They make their scrumptious truffles, called Truffes du jour. The Grand Cru Chocolat Chaud is made from a mixture of cacao from Venezuela and Ecuador and presented as shaved chocolate. It is sold in an elegant black with gold trim oval tin. Simply add steaming milk for a truly luxurious hot chocolate drink. Stir until the chocalate swirls have dissolved, then add a measure of liqueur. Top it with freshly whipped cream, and you will have an adults only drink. If you are a chocolate lover, you cannot simply skip visiting Sprungli when you are in Zurich. Their chocolate is light as air and melts in the mouth. Once you have tasted Sprüngli / Lindt chocolates, your taste buds will not be satisfied with anything else. If you can't travel to Zurich, you can satisfy you chocolate hunger with any of these products. I haven't tried this product but it sure looks interesting to have a go. I love to try different brands of chocolate and this might be one of the best chocolate in the world.